Below I'll outline the steps I took to create the newest member of my Dungeons and Dragons character family. 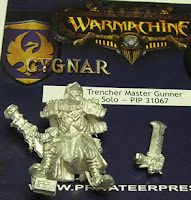 This is actually a model of a Cygnar Trencher Master Gunner from Privateer Press' War Machine series, with some slight modifications - goes to show even sci-fi models work in fantasy. Here he is, right out of the package. The first thing we need to do is a little modification. It's difficult to take a picture of this, so I didn't, but you must inspect the model for mold lines. Usually they'll be up his sides. Don't forget between his legs too. Scrape all these lines off with a knife. Some people suggest a file, but I find that leaves things rougher. The character is intended for a fantasy setting, so the gun has to go. In this case, the gun was barely touching his thigh, so a removal is possible. 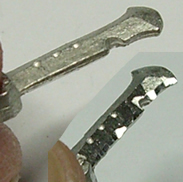 Using fine wire cutters, remove the gun from his hand and thigh. 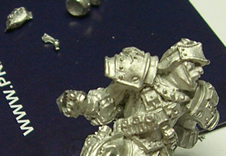 The arm attaches with a keyhole shape. Cut the square part off, leaving a circle, which allows you to attach the arm in any direction. 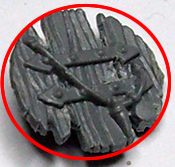 Using an old Skaven shield I had in my bitz box, I make the planks more defined by cutting away from the circle it used to be in. I actually use a dentist pick to easily scrape these sections away. Swords always seem to come with blunt blades. First, I scrape both sides of the business end to sharpen it, then cut scratches in it to add some wear..
As a final touch, I cut scrapes and scratches into his armour and coat in various places to add wear and weathering. Glue the model to the base. Wait for it to dry, notice how it crackles. Prime the model. In this case, I chose black. 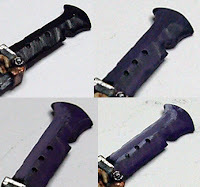 Snakebite Leather thinned slightly with water, streaked on. 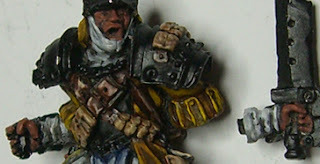 Tanned Flesh painted on raised areas and edges to highlight. Vomit Brown thinned with water some to highlight the raised areas. 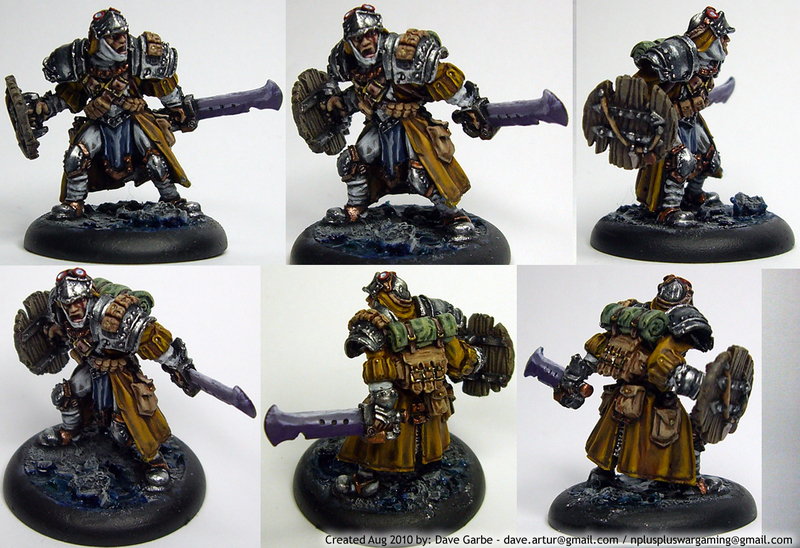 Iyanden Darksun to highlight the very tops and some edges. Notice that I don't highlight much of the coat between his legs as it's in shadow. Fortress Grey to highlight the raised areas. Knarloc Green thinned slightly and painted on to highlight edging. Shadow Grey to highlight edging and raised areas. Elf Flesh to highlight ridges. Rotting Flesh to highlight edges and raised areas. Space Wolves Grey as a final highlight. 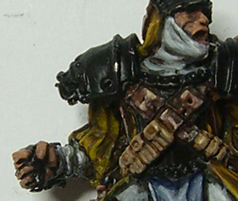 Golden Yellow to bring back some of the strongest highlights after the wash.
First I start with a Tanned Flesh highlight of the black basecoat, leaving the darkest recesses black. The paint is thinned some. Next I use 1 part Tanned Flesh mixed with 1 part Elf Flesh to highlight most of the raised areas. I throw on a layer of Ogryn Flesh wash to blend the first two layers. Then give a final highlight of bleached bone. To finish his face, I paint the raised areas for his eyes white, and dab on some black pupils. I also wash a Red Gore into the scar on the left side of his face. 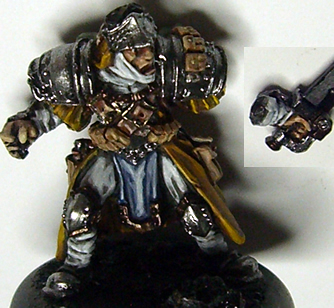 First, repaint any areas you have to Black if your previous steps got any colour on the armour, then continue. Boltgun Metal to highlight most of the areas, excluding the recesses. Tin Bitz, still avoiding the recesses. Shining Gold to highlight the black. 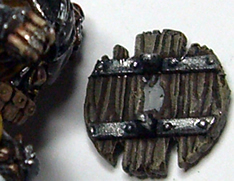 Chainmail highlights or dry brushes in some areas. Paint them black again if need be. Use Regal Blue, but first dip your brush in water, then place a drop of the heavily coloured water into each lens. P3 Khador Red - I use this because it covers dark colours better than Citadel paint. Same technique as above, using Ice Blue. Highlight with Blood Red since P3's colours aren't as intense as Citadel paint. Same technique as above, using White, though use a little more water. White washed slightly in streaks, following contours of the blade. Dry brush Desert Yellow on, heavier at the top and bottom. 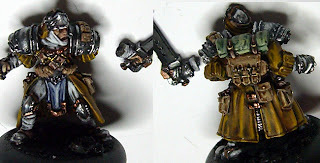 Kommando Khaki as a final light highlight. Slapped on a little thinned down Dheneb Stone. Prod at the base some with a toothpick to see if any of the pieces detach. 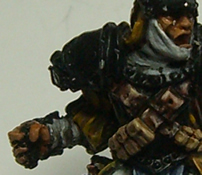 Use a thick wash of Chaos Black to fill in cracks and deepen things. 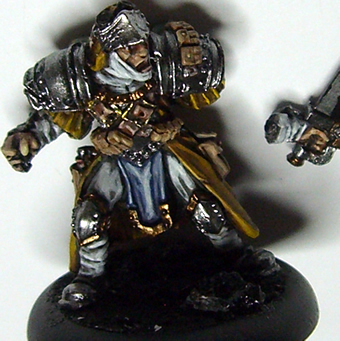 Then a highlight of Space Wolf Grey with a dry brush. 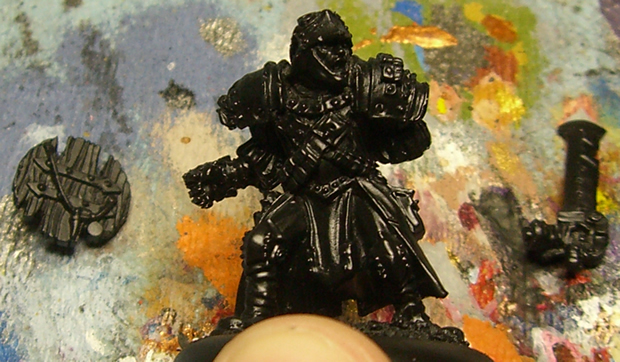 A Badab Black wash will blend the dry brush in. Finally highlight the tips and edges that aren't beneath him with a Fortress Grey dry brush. Use an old brush to spread it where you want the water. 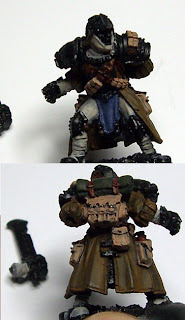 Repeat this using Thraka Green while the Blue layer is still wet. Once all the painting is done, you can glue on the parts that need to be attached. Scrape the paint off of the parts that will be glued. 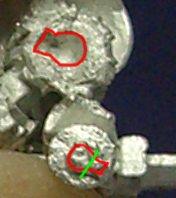 On the arm, this also means inside the hole. For the shield, scrape the knuckles as well as the shield. Wow - now that's a tutorial worthy of being printed. 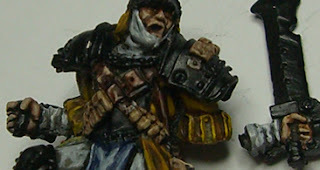 You should submit it to any wargaming e-zines you know of!! Wow i never thought of using other minis for D&D. 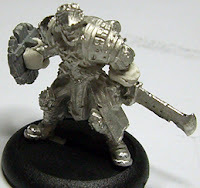 Cool conversion of the Warmachine mini. @Tristan: Thanks, I don't really know any ezines though From The Warp (link on the right) has a large selection of tutorials gathered from their members. I have pondered that perhaps at some point far down the road when I have a large selection of tutorials, selling dead-tree copies as some people still prefer paper. 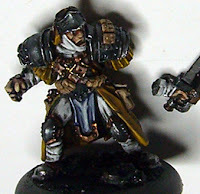 I was surprised how many models in the War Machine line either worked for fantasy right away, or would take just a quick snip to remove a gun or two. Great step-by-step for each of the elements. 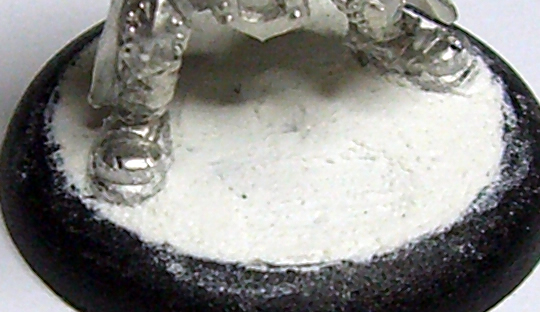 I like the cracking ground on the base, simple, yet looks cool.